The purpose of this letter is to invite each of you to Pledge your support, as those controlling the most relevant levers of power and as senior members of the Labour Party, to the cross- party “Campaign for Clean Air in London” with its primary objective being “To achieve urgently World Health Organisation (WHO) recommended standards of air quality throughout London”. This letter invites simultaneously an identical Pledge from the other main political parties and their key national and London representatives (who are asterisked in the Courtesy Copy list at the end of this letter). We would welcome Pledges from the other organisations copied. We wrote to the Prime Minister on 23 December 2006 inviting him to Pledge his support to the Campaign and its primary objective and await his reply. Demonstrate the political will necessary to achieve and exceed WHO recommended standards for air quality by taking tangible steps that result quickly in measurable improvements in air quality. We all know that once the political will exists to tackle air pollution that practical ways of addressing it will be found as they were in the past for sulphur dioxide, leaded petrol and the ozone layer. It really is that simple. These six fundamental principles underpinned a letter from The Knightsbridge Association to the Department of Environment, Food and Rural Affairs (Defra) dated 25 June 2006 (which can be downloaded from our website), responding to its consultation on a national Air Quality Strategy, which sought 12 commitments to improve air quality in London. That letter was supported by more than 20 community groups, representing most of Central London, with the majority of them seeking the same 12 commitments in respect of their own areas. We are delighted that leading London politicians Angie Bray AM (Leader of the Conservatives in the Greater London Assembly (GLA)), Mark Field (Conservative MP) and Darren Johnson (Green and Chairman of the Environment Committee of the GLA) made early public statements supporting our Campaign. We request respectfully that you each reply personally please to this letter in your capacity as Secretary of State (or as a senior Labour Party MP if necessary to satisfy Defra etiquette) and Mayor of London respectively. We look forward to receiving also your responses to our letters to you dated 12 November and 3 December respectively. iv. Finally, we urge you to identify international best practices on air quality management, to back them with robust legislation and to ensure their rapid implementation throughout London. Please see also our website “Air quality: Campaign for Clean Air in London” on the BBC Action Network at https://cleanair.london/ where this letter has been published today. In due course, we will publish periodically on the BBC Action Network a list of those politicians (i.e. those asterisked at the end of this letter) who have supported the Campaign for Clean Air in London, been approached but not yet confirmed their support or declined to support the Campaign. We hope, sincerely, that your Pledge will be on the list. Thank you for taking seriously our concerns about air pollution in London and giving the issues we raise your particular attention. 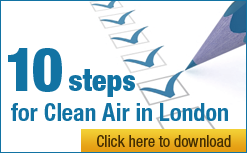 We recognise that you are already taking many steps to improve air quality in London.